Familiarity. It breeds contempt. It can also breed competitiveness. That’s a big key to this game between the Bulls and the Black Knights. This is the third straight season that these two teams will play. Each has won one of those games. For Army, they understand Buffalo’s schemes and the skills of many of UB’s key players. But the bigger advantage in familiarity may fall with the Buffalo defense, and their understanding of Army’s triple option offense. Because it’s so unusual in its approach, style and blocking angles, the triple option is nearly impossible to prepare for in one week. As pointed out by Bulls radio analyst Scott Wilson, Oklahoma had not faced a triple option team in 17 years before last Saturday. That played a role in the Black Knights piling up 339 yards rushing. The Sooners, even with more overall talent, could not adjust to such an unfamiliar offense. The Bulls won’t have that problem. Many of the key defenders will be seeing the triple option for the third straight year. Will that be enough to control the Army ground game? We’ll see. But Army’s season opening loss came to Duke, another team playing the Black Knights for the third straight year. 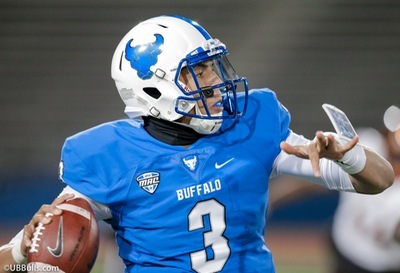 Bull Session Trivia: Tyree Jackson is 80 yards away from 5000 career yards passing. He would be the 6th UB quarterback to reach that mark. Can you name the other five Bulls QB’s who have thrown for 5000 yards? The Bulls have scored 23 touchdowns in four games. 11 of those have been scored by freshman. That amazing stat comes courtesy of UB sports information guru Jon Fuller. It signals that while the present is amazing, the future is bright for the Bulls offense. RB Kevin Marks has five, RB Jaret Patterson has three and WR Charlie Jones has three. Lance Leipold and the coaching staff have never been afraid to put talented players on the field, regardless of age. That is paying off now and illustrates the increased level of maturity and talent that’s being recruited…On the occasion of alumni weekend, tell me that Marks doesn’t remind Bulls fans of James Starks, while Patterson looks and runs a lot like Branden Oliver…Patterson’s breakout game vs. Rutgers (104 yards) continues to display the running back depth. Three different backs have led the Bulls in rushing this season, and four on the roster have now run for over 100 yards in a game…Buffalo’s offense has topped 30 points in seven straight games, the third longest streak in the country behind UCF & Penn State…Tyree Jackson’s 15 touchdown passes are now tied for 10th in UB’s single season record book. After just four games. He is beyond halfway to Joe Licata’s record of 29…His 36 career TD passes are 5th alltime…Jackson leads the MAC in passing yards and touchdowns…Anthony Johnson and K.J. Osborn are both averaging over 17 yards per catch. Jones’ 23.7 average per catch would rank in the NCAA top ten, but he’s one catch shy of the minimum…UB’s offense had five plays of 30 yards or more in the FIRST HALF against Rutgers…The Bulls offensive line is now the only group in the NCAA to not allow a sack. Beyond that, they rank second in the country in fewest tackles for loss allowed…First quarter scoring this season: UB 54-3…Army’s defense is a base 3-4, a style the Bulls will see for the first time this season. They are a veteran group, with five senior starters…Because the offense controls the clock so much, the Black Knights don’t have to substitute as much on defense. They can also take more chances to create turnovers. The Bulls will see a lot of blitzes and stunts. Last year, the two turnovers forced on Bulls fumbles were huge plays in the game…LB Kenneth Brinson is the best pass rusher and most athletic player. LB James Nachtigal is always around the ball, and had 103 tackles last year…CB Elijah Riley is the leading tackler. Fellow CB Mike Reynolds is a very good cover cornerback. For the last three games, Army has started safety Max Regan as a nickel back. Look for that to happen again to try and contain the explosive Bulls passing attack…This season, Army’s defense has allowed 10 plays of 30 yards or more, including four of more than 50 yards. Bullet Points: 21. That’s how many passes the Black Knights have completed this season. That’s already one more than all of last season. Despite the familiarity factor pointed out above, the Bulls will have some challenges to overcome. Last year, the two teams played in Week Two and Brian Borland’s defense spent preseason practice time working on the triple option. That wasn’t as easy to do this year with the game in Week Five. Last year, senior linebackers Jarret Franklin and Ishmael Hargrove were on the field a lot. Both are gone, and there will be a learning curve for replacements Jordan Collier and James Patterson…DE Chuck Harris, with 1.5 sacks against Rutgers, continues to lead the MAC and ranks 3rd in the NCAA…DT Chibueze Onwuka has had three TFL’s the last two games. His quickness has been hard for opposing offensive guards to stop…DE Taylor Riggins is making plays on a weekly basis. The sophomore from Rochester is a transfer from UMass who sat out last season…Khalil Hodge is up to 9th in the NCAA in tackles. He’s tied for first in the MAC. 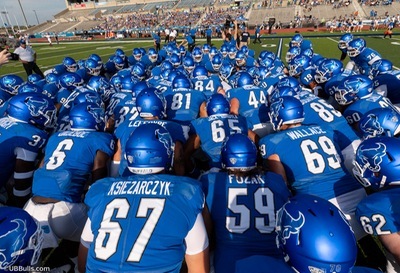 Hodge is just four tackles from 8th in UB history, which would mean passing Khalil Mack…The Bulls defense leads the MAC in points allowed and third down defense. They’re second in sacks and red zone defense…Aapri Washington has been a pleasant new addition to the cornerback position. He saw his most extensive playing time against Rutgers when Cam Lewis was injured…Army leads the country in time of possession at 40:53 minutes per game. They controlled the ball for 44:41 minutes against Oklahoma…The Black Knights new quarterback is Kelvin Hopkins. He’s a much better passer that last year’s starter Ahmad Bradshaw. But he’s emerging as a runner, his first job, with back-to-back 100 yard games…The fullback is still the key to the Army run game. They will use four of them, with Darnell Woolfolk starting. He ran for 91 yards against the Bulls last year…Two slot backs will line up behind the tackles in Army’s standard formation. When Hopkins runs the option, those slot backs will be in position to run the ball. Kell Walker is the best one, and he had 80 yards against the Sooners…Breaking tendencies, Army focused on the edges in that game. According to the Army Football Insider Blog, they gained 131 yards on runs to the left and 61 on runs to the right. That may have been driven by expecting Oklahoma to sell out on the fullback and QB runs up the middle…Walker is the team’s leading receiver with six catches. Wideouts Cam Harrison and Christian Hayes are both averaging over 29 yards per catch, thanks to the surprise element of the Army passing game…Four of the five offensive line starters are new. Center Bryce Holland is the lone returner, and he’s started 28 straight games…Army is converting 51% of third downs, and they’ve converted 13/15 fourth downs. As Leipold says, when they go for it on fourth down that much, they only need 2.5 yards per play to keep drives alive. Army’s best defense is their offense. The Black Knights offensive style works the clock, and leaves the opponent’s offense spending a lot of time on the sidelines. When the offense is not on the field, they can’t score. Against Oklahoma, Army limited the Sooners to just seven real possessions. This season, Black Knights opponents have averaged just 10 possessions per game, and 49 plays per game. For comparison, the Bulls had nine FIRST HALF possessions at Rutgers. They average 71 plays per game. All of that means the Bulls will need to be efficient on their drives. If they only get 8-10 offensive opportunities, they may need to score on 4-5 of them. For an offense that likes to score quickly, the standing and watching will be hard. “We just have to be patient and not press. We have to maximize those possessions and really every time we’re on the field capitalize and view it as an opportunity to score,“ says Bulls center James O’Hagan. Bull Session Trivia Answer: Here are the five UB quarterbacks who have thrown for 5000 yards: Joe Licata (9485), Drew Willy (8748), Cliff Scott (7578), Marty Barrett (6945) & Joe Freedy (5912).